Gum disease is an infection of the surrounding tissue and bone that support your teeth. There are different stages of gum disease, depending on the severity of the infection. If left untreated for too long, late stages of periodontal disease can occur which may lead to tooth loss. Many factors can increase your risk of periodontal (gum & bone) disease, but inadequate oral hygiene is the most common cause. Your mouth continuously produces a clear and sticky substance, called plaque. Plaque commonly forms around the point where your teeth and gums meet. If done correctly, daily brushing and flossing can prevent plaque to form into tartar. Tartar, occurs when good oral hygiene habits are not maintained. Plaque eventually hardens into tartar. Unfortunately, tartar cannot be removed by brushing or flossing. Only a professional cleaning from a dentist or hygienist will remove tartar from your teeth. The longer plaque and tartar stay on your teeth the more harmful they become. Plaque and tartar carries lots of germs and bacteria. As plaque and tartar collects along the gum line, bacteria continues to multiply. This process eventually leads to an infection. In effort to eliminate the bacteria causing an infection, your immune system releases substances that irritate the gums, causing inflammation. This means that gum disease has progressed to an early stage, called gingivitis. Gingivitis is an early stage of periodontal disease. This stage of gum disease occurs when the gums become inflamed. With professional dental treatment, gingivitis may be reversible. Although, the symptoms of gingivitis are very mild and many people are unaware they suffer from gum disease. This is why it is important to maintain frequent visits to your dentist. If gingivitis is not treated, it will progress to a more severe form of gum disease, called periodontitis. Untreated gingivitis commonly advances to periodontitis. Healthy gums and bone hold teeth in place. Your gums attach to your teeth below the edge of your gums. This is called the “point of attachment”. This late stage of gum disease means it has spread below the point of attachment. When this happens, your tissues and bone supporting your teeth become affected. The infection eventually irritates the tissue and bone so badly, they begin to break down. At this point of periodontitis, your gums begin to separate from your teeth. This forms tiny pockets and as the infection gets worse, the pockets deepen. The infection eventually destroys the surrounding gum tissue and bones, causing teeth to loosen. At this point of gum disease, treatment may involve removal of the affected tooth. This distracted process usually does not cause any pain. So, many people don’t even realize that they are in the late stages of periodontal disease. This is why it is important to educate yourself on the causes, symptoms, increased risks and preventative measures. Treatment options depend on the stage of stage of gum disease the patient appears to be at. The following, are periodontal (gum & bone) disease treatment goals. 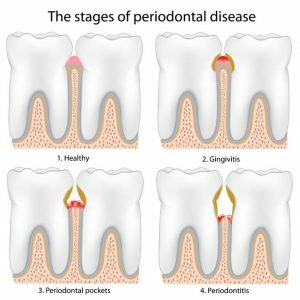 At late stages of periodontitis, pockets surrounding the teeth have become so deeply due to infection, treatment may involve removal of the affected tooth. Orthodontic treatment, including braces can play different roles when involved with gum disease. Malocclusion and overly crowded teeth may affect interfere with maintaining proper oral hygiene. If you experience crowded teeth, you may notice difficulty brushing or flossing in certain spots. In this case, orthodontic treatment may be recommended to help align teeth, allowing adequate oral hygiene in all areas of the mouth. Orthodontic appliances may make brushing and flossing more difficult. 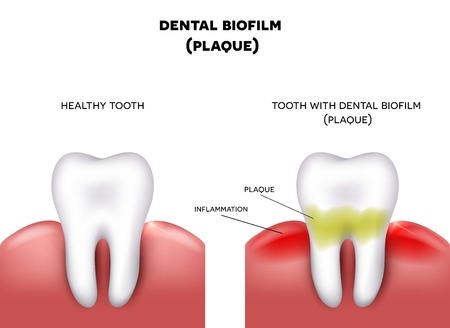 This can lead to more plaque to form than usual, leading to gum disease. A patient may also suffer from gum disease prior to the delivery of braces. If orthodontic appliances act as a large obstacle in maintaining adequate oral hygiene, treatment may aggravate the condition. If periodontal problems cannot be controlled, orthodontic treatment may have to be discontinued prior to completion. If you have any further questions regarding periodontal disease or orthodontic treatment, feel free to call York Orthodontics at 289 588 8747, or email us at info@yorkortho.ca .